The Tone effect lets you add a dark-coloured region to your drawing and simulate the shaded area away from a light source. To produce the tone effect, create a drawing to control where the tone will appear. The Tone effect uses a matte to determine the shape and position of the tone on your drawing and can be blurred at the edges to create a softer effect. Click the Add Layers button and select Effects > Tone. The Tone effect is parented to the selected layer. 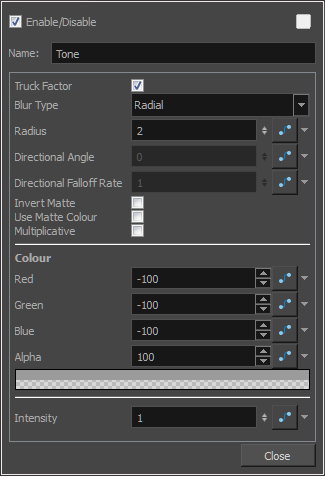 Display the Tone properties and adjust the properties to control the type and amount of blur and the colour of the tone effect.